Gold demand in India, the world’s biggest buyer of the precious metal, remained lively this month. The festival season, traditionally a time to buy gold, is underway in India and will peak with Dhanteras and Diwali next month. Prices are coming down and people are making purchases. Since prices are still very high, some buyers prefer coins and bars over jewellery as small piece of investment. Since October 1, a gold price has lost 3.54% in USD terms as prices moved from USD 1774 per ounce to USD 1711 per ounce. In rupee terms, gold has moved down from Rs 31090 per 10 gram to Rs 30775 per 10 gram, a loss of 1.01%. As Indian rupee has weakened 2.5% against greenback from Rs 52.4 per piece to Rs 53.71, a loss of 2.5%, gold prices in rupee terms has seen less weakening. Gold prices have been on a declining spree for the third straight week. The prices in dollar terms have slipped as gold faced stiff resistance to cross above $1,800 an ounce. The US Federal Reserve meeting has had a few surprises as they held to the previous commitment on holding interest rates at zero till mid 2015 and maintaining $40 billion in monthly buying of mortgage backed securities. The markets across the board are also eyeing the US presidential elections and are refraining from taking long positions ahead of that. 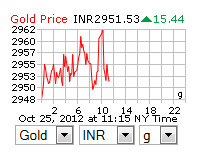 So, while the global gold prices have slipped to 1-month lows, the Indian gold prices have also declined to 1-week lows. In the Indian markets though, we are in the middle of the festivities and buyers are looking at various avenues to buy gold. The rupee moves are favorable to lower calculation in rupee terms. After having seen an all-time high level of Rs 32,400 per 10 gram in the previous month, investors find the current prices relatively lucrative. So there is a strong demand from jewelers and retailers alike on purchases, as prices dipped below Rs 31,000. The industry estimate is that with the rupee consolidating at current levels and the global gold prices declining, the Indian gold prices could be headed lower and may go below the Rs 29000 per 10 gram. However, levels below that would be favorable for the medium to long-term investors. While the current year may have seen its highs in gold and silver, miners and banks feel that gold will be doing good for its 13th year of gains in 2013 on lower interest rates, high inflation and global growth uncertainty.